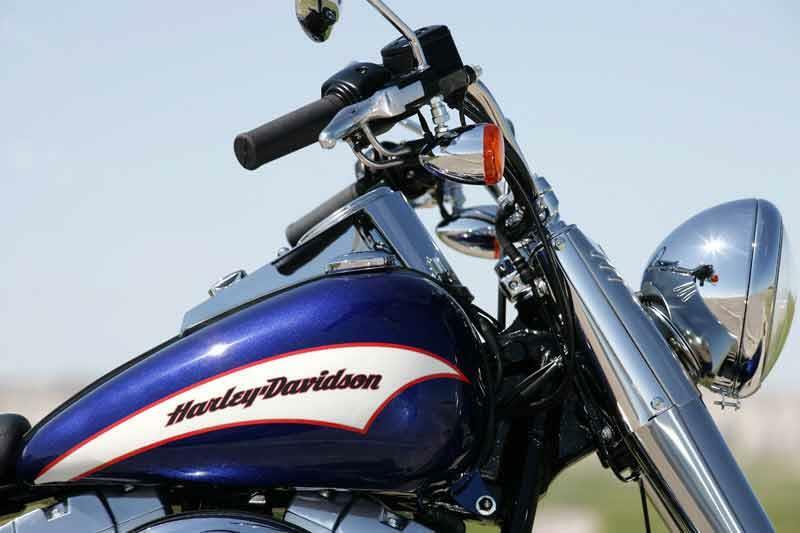 Big Harley-Davidson with classic 50s styling and the latest version of their much loved, air cooled engine. The defining feature of the Harley-Davidson Heritage Softail family is the hidden rear suspension so it looks like an unsprung ‘hardtail’. 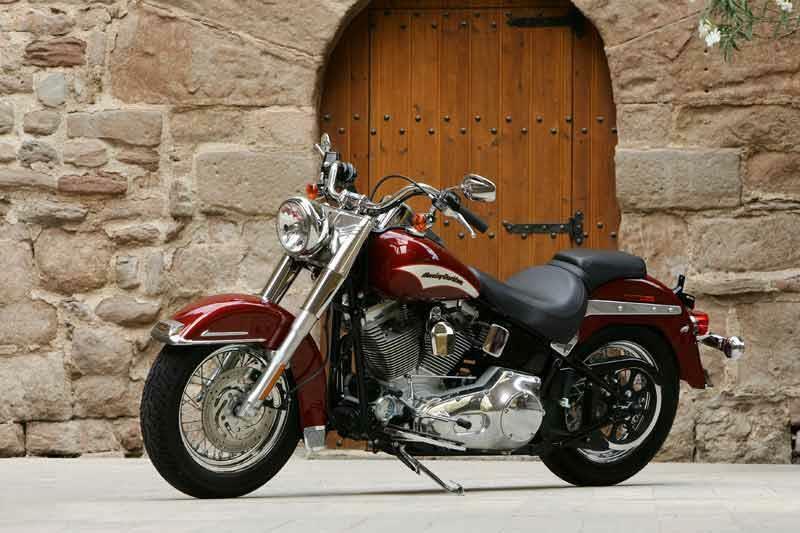 It’s a recently re-released and modernised family designed to appeal to Harley-Davidson’s traditional customer. 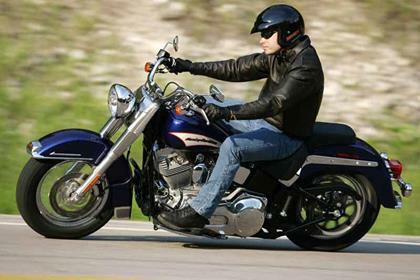 Like all modern Harley-Davidsons, handling is surprisingly capable. Yes, it’s softly sprung and heavy but ground clearance is more of a limiting factor than anything else and you can whip along a twisty road at a more-than respectable pace. 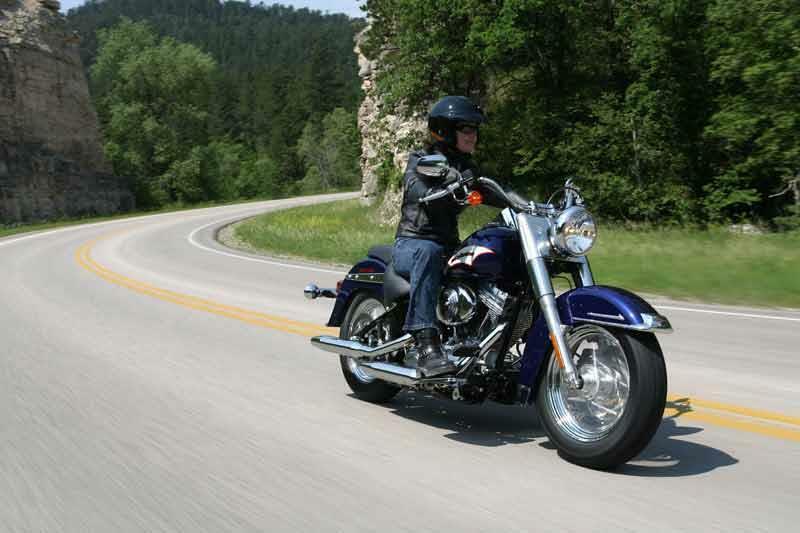 The Harley-Davidson Heritage Softail's brakes are poor – one front disc really isn’t enough. 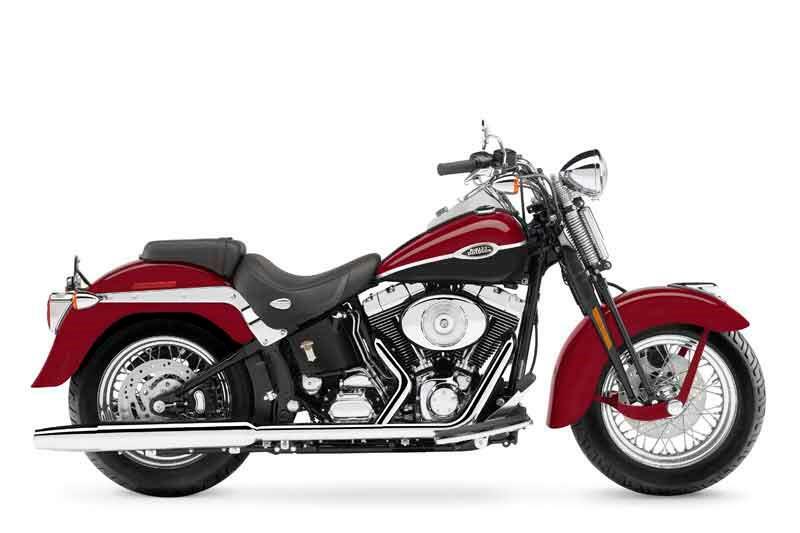 The Harley-Davidson Heritae Softail family got a new engine for 2006 – well ‘new’ isn’t strictly true – it’s heritage is 100 years old. But the ‘96B’ variant in the Harley-Davidson Heritage Softails uses balance shafts instead of rubber mounts like the rest of Harley’s range. It shakes like a fitting Hippo at tickover, produces excellent torque at low revs and runs out of puff at about 90mph. Well built, like all modern Harley-Davidsons. Breakdowns are fairly rare as are major problems as long as the motorcycle is well cared for. 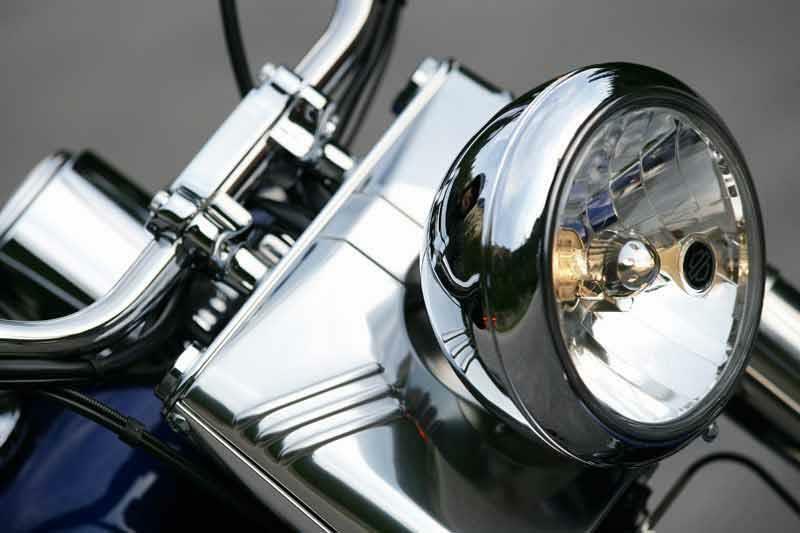 Corrosion can be a problem with the Harley-Davidson Heritage Softail but few get used in winter – just as well as it slashes resale value. Expensive when new, like all the large Harley-Davidsons. It’s far from the most expensive of the bunch though plus holds its value exceptionally well on the used market. Quality extras can even add to the value of a motorcycle – very rare as with most other machines standard motorcycles are the most desirable. 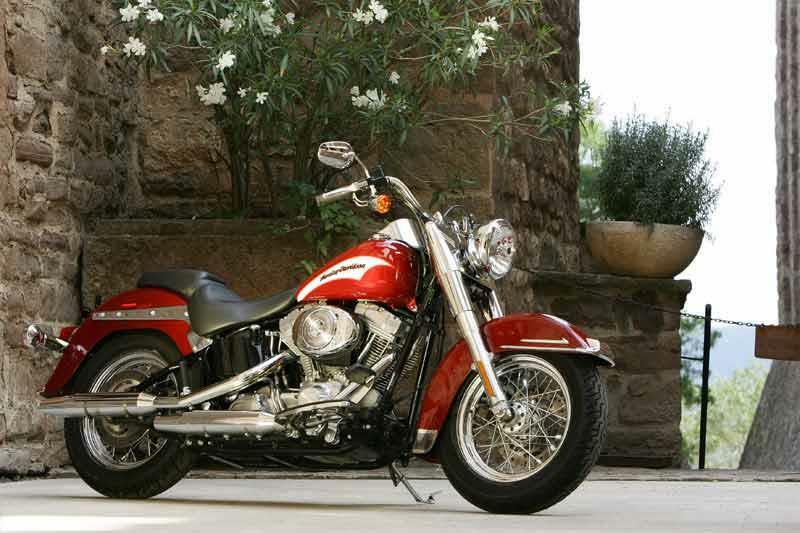 Find a Harley-Davidson Softail for sale. The standard Harley-Davidson Heritage Softail is not exactly loaded up with goodies. There’s little more than the bare minimum. Plenty of people find the rider seat comfy and the foot boards are novel but offer no real advantage over pegs. Pillion’s get a smaller seat and nothing to hold onto. Fortunately after-market extras are virtually limitless. 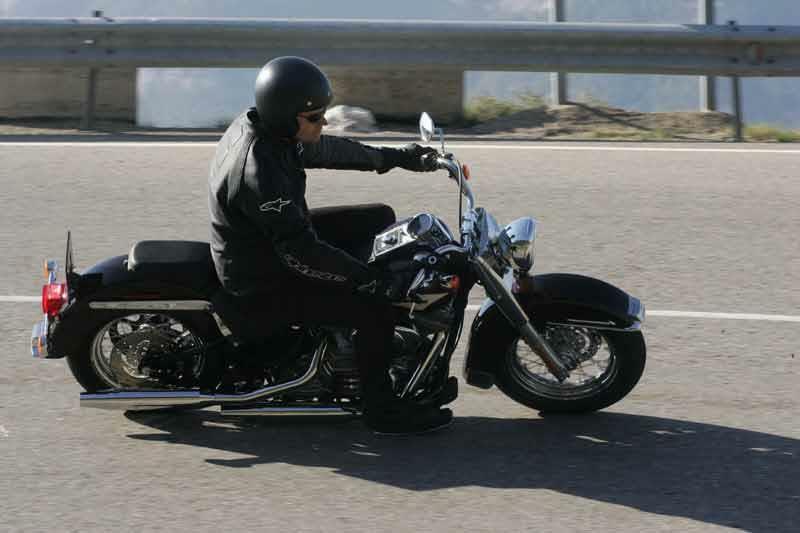 2005: Harley-Davidson Heritage Softail launched – although an earlier Harley-Davidson Heritage Softail was sold from 1985-1990. 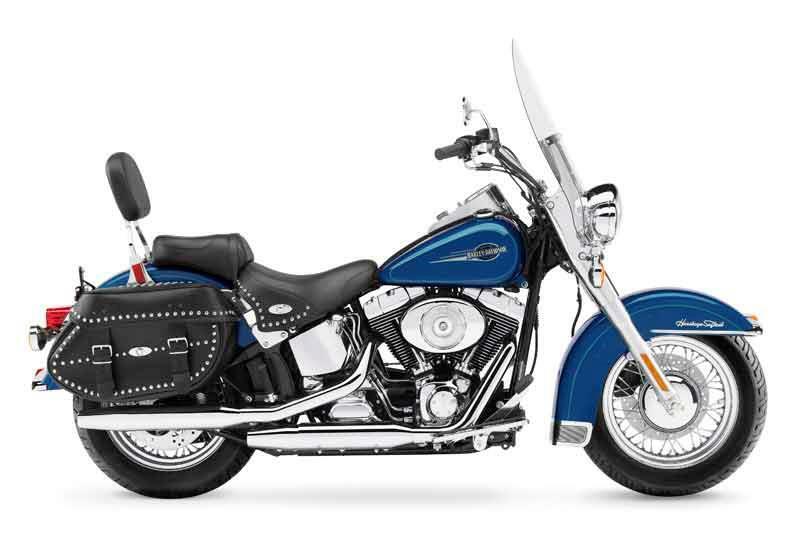 Harley-Davidson Heritage Softail Classic: all out retro-tourer styling, chrome laced wheels, leather studded saddlebags and sweeping fenders. 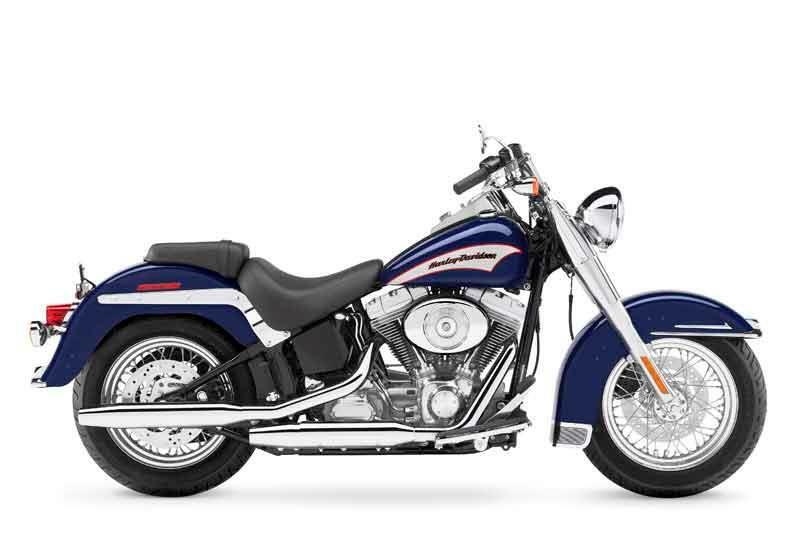 Harley-Davidson Heritage Softail Springer: takes the retro theme even further. Springer front suspension coupled with 1930s style olive pearl and black paintjob, tombstone tail lamp and full rear fender. 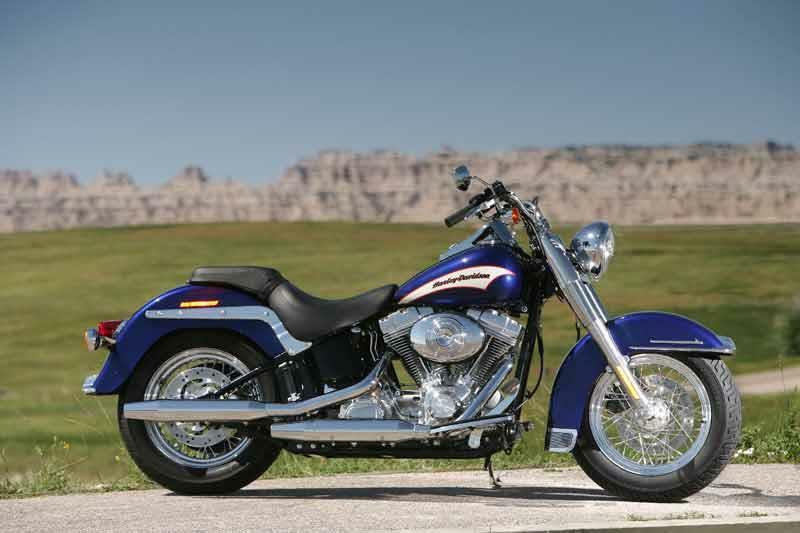 3 owners have reviewed their HARLEY-DAVIDSON SOFTAIL (1988-on) and rated it in a number of areas. Read what they have to say and what they like and dislike about the bike below. Nothing is ever perfect but this little beauty does it's best and comes close. Chrome Heaven. Great ride. Great performance. Superb looks. Fun on a Harley and 2 for the price of 1 - what's not to love ???? The one and only negative is seat comfort. But it is PERSONAL. I broke my coccyx a long time ago. Also have lower back issues. [Sporting as a youngster! Always comes back and bites where it hurts]. The seat comfort is a universe better than my old Sportster, BUT after 2 or 3 hours I do feel it. I've recently ridden a 2018 Road Kind and the seat in that is to die for. I aim to get a replacement along those lines. It's an 1800 and as Harleys go is fast and loud with a decent high end. I truly believe way in of in excess of the published 130mph. The previous owner tells me he did 140mph on a huge stretch of Autobahn's without a murmur and I have no reason to doubt him. I've managed **ahem** easily and the handling was exceptional. After the chill down it carries on without batting an eyelid. It's a 2010 so may not be as finely tuned and perked as recent models since newer technology has come in since. However it goes like the clappers [in Harley parlance] and most importantly the THUMP THUMP beat box bass blasters hear me coming a country mile off. I will get a heat deflector fitted at some stage because the usual bunged up British roads mean that you are sitting on a barbecue when gridlocked. Pure Chrome. Exceptional build. Parts are immaculately made to give the machine an impressive and solid feel. Mine is a 2010 and there is no corrosion except the usual minor chips etc from where flying debris coming from other road users. I bought the bike from a HD Dealer at 17,500 miles. Neutral was awkward to select. They immediately replaced them and the clutch system, no quibble. Runs like the wind and sounds awesome. When stripped is a magnet for onlookers and admirers, because of its quality and features.  Last week I was involved in an accident. A Muntjac Deer sprang out of a hedge smashing into my left side. The bike held firm. Because of its build and control I never came off which on a Jap or inferior bike, I would have and been badly injured if not worse. The gear linkage and lever were bent out of shape but not busted. There were other small bits cosmetically damaged, but that was all. That proves the quality build of the parts. This bike was awesome. In the end and because of its quality, it was a few bent bits that required replacing and not a whole bike and ME! It's a CVO. It's more expensive than the bog standard. That's the whole point - you've bought the best looking ride. It's a Harley!! Remind me, are they Jap purrers or Iconic Legends?? Buying the best doesn't always mean great value... in this case IT CERTAINLY DOES. I get about 180 miles + out of a tank...easy, but I've never run down to empty. That includes long rides, short rides and opening her up, doing some fast riding. All standard equipment is excellent. Keyless ignition. The usual alignment of buttons and knobs. It has a computerised speedo I thought I'd hate, but love. The rev counter is a great feature. The computerised fuel gauge is another great add, but there is also a fuel gauge in the 2nd tank cap which adds to a feeling of pure decadence. Chrome foot plates [so gorgeous and comfy] Stinger Chrome wheels which are stunning and so easy to keep clean. It's every chrome buffs dream. Less than a couple of minutes to unfrock this beauty from a tourer to a cruiser. Both look the bomb. I love her saucy Cruiser stare I have to admit. Plenty of bag room for singletons with the double panniers. Two up, you're gonna need another bag, which fits easily and conveniently onto the rear rack, but as long as you aren't Liz Taylor, you aren't gonna need much more and your space to move will not be restricted at all. Pillions get wonderful old fashioned bicycle pedal style foot pegs and a comfy back rest too. The horn is loud and WOW so are those V&H pipes. However there is a minor exception worth mentioning...the windshield. It needs to be 6-8 inches taller. At present height it causes a vortex thus meaning a bit of bonce buffeting, which is a shame. Let's face it, there's no reason why it is so low [yeh the 'cool looks'] but it's a tourer and that should have been factored in. This model missed out on ABS [THANK the Gods of braking] but also Cruise mode. The following years model benefited. I would have liked that [mainly to keep speeds down in camera and speed enforcement areas.] I'm on Dunlop factory fitted and I've no problems so far. I bought the bike from HD Cheltenham. 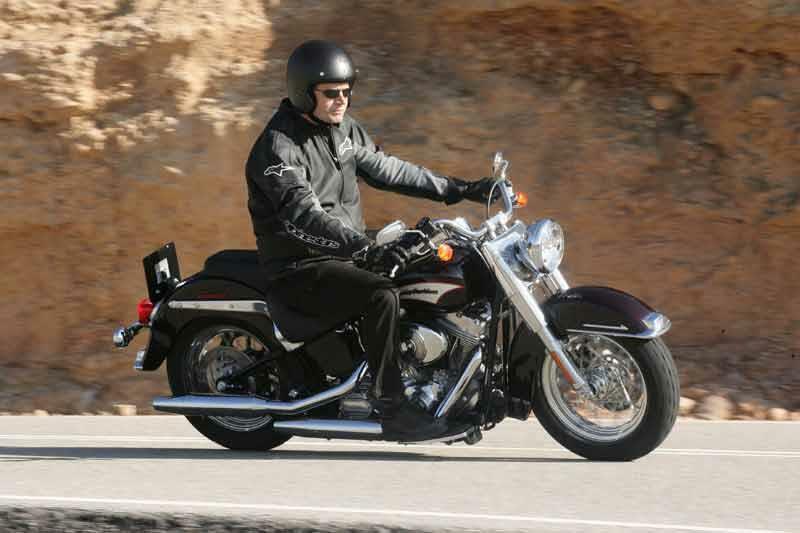 Buying a Harley from any dealer you don't know is an unusual experience. In fact buying a Harley is an unusual experience full stop let's face it. After the usual tutting, umming and arring on both sides an amicable deal was brokered. The usual Harley warranties and 100[?] point plan etc etc all added to peace of mind. Plus free HOG membership. Also there was a warm family atmosphere and the pleasant staff all added to my Harley experience. Post sale care has been exceptional. I've had the best. Neutral was a tough find, the gears and clutch were replaced instantly without question. The fuel cap was rattling, replaced no problem. I have upgraded and added bits since [i.e. a Heavy Breather and with a Chrome Cover] because I trusted them and they deserved my custom! Highly recommended. It needs a little fine tuning - a different seat, perhaps pullback bar risers to make it fit me perfectly. Once I get around to it I'm sure it'll be 5 out of 5. Rides, and stops great, but the footboards will catch you out on tighter/faster corners. Not a big worry as they're hinged, but they won't stay 'showroom condition' for long! It's a Harley. They're bulletproof... and sound it too. Overall I could not fault the Bike... for the engine size this bike is surprisingly light and easy to handle... The only bad thing about the screen is that you pick up a lot of turbulence at high speed which hits you on the forehead... however you can unclip it which removes the problem..